Photo: Maine DEP. Drawing: University of Florida/IFAS Center for Aquatic and Invasive Plants. Fanwort is a submerged plant with narrow leaves which resemble a fan arranged on a narrow stem. The majority of the plant is submerged. The small white flowers of fanwort emerge from the waters surface. Also characteristic to fanwort are the small lily-like leaves that float on the surface below the flowers. Fanwort has been in New England for over fifty years. Although it is not yet a problem in Maine, fanwort is a nuisance in neighboring New England states. 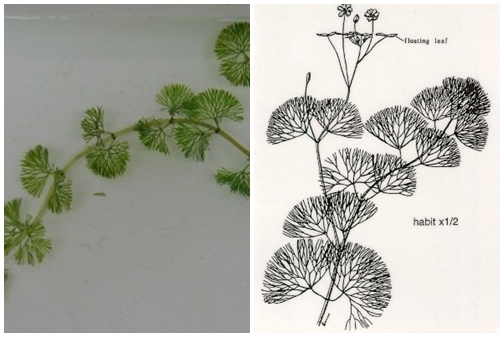 This plant was commonly used in aquariums as an ornamental plant. It entered lakes and ponds when dumped from aquariums, and it is also transferred from one lake to another via boat and trailer. Fanwort has the potential to quickly invade shorelines of lakes and ponds and impair recreational activities.